Irreversibility is a fundamental concept with important implications at many levels. It pinpoints the fundamental difference between the intrinsically reversible microscopic equations of motion and the unidirectional arrow of time that emerges at the macroscopic level. 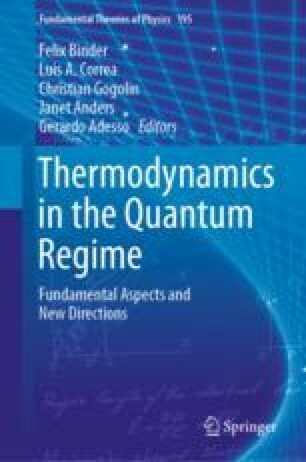 More pragmatically, a full quantification of the degree of irreversibility of a given process can help in the characterisation of the performance of thermo-machines operating at the quantum level. Here, we review the concept of entropy production, which is commonly intended as the measure of thermodynamic irreversibility of a process, pinpointing the features and shortcomings of its current formulation. TBB acknowledges support from National Research Foundation (Singapore), Ministry of Education (Singapore), and United States Air Force Office of Scientific Research (FA2386-15-1-4082). He acknowledges helpful discussions with R. M. Serra and his group at Universidade Federal do ABC, while developing some of the work reported in this chapter as part of his Ph.D. thesis. SG gratefully thanks Filippo Caruso, Stefano Ruffo, Andrea Trombettoni, and Matthias M. Mueller for useful discussions and their support, especially during the last period of his PhD thesis. GTL would like to acknowledge the São Paulo Research Foundation, under grant number 2016/08721-7. JPS would like to acknowledge the financial support from the CAPES (PNPD program) for the postdoctoral grant. MP thanks the DfE-SFI Investigator Programme (grant 15/IA/2864), the Royal Society Newton Mobility Grant NI160057, and the H2020 collaborative Project TEQ (grant no. 766900).